There are some big potential changes coming to the bid protest process at the Government Accountability Office (GAO) in 2016. It is possible that this year will bring a formalized electronic docketing system, a fee for filing protests, and a sunset on an important part of GAO’s bid protest jurisdiction. In recent months, representatives from GAO have suggested that the new electronic docketing system should be introduced sometime in 2016. The Consolidated Appropriations Act of 2014 authorizs GAO to charge protesters a filing fee to support the establishment and operation of the electronic system. Unless Congress acts, GAO jurisdiction over protests of task and delivery orders under Indefinite Delivery, Indefinite Quantity (IDIQ) contracts issued by civilian agencies is set to expire September 30, 2016. If you ask government contractors to talk about what affects their business, it takes less than a minute before you hear the familiar refrains of budget cuts, sequestration, and political gridlock. Those issues may be at the top of everyone’s minds now, but for those who do business with the government, a long-term vision is essential for surviving Washington’s ongoing crises. Capital Business asked local executives to take a step back and name one issue that will be a game-changer for contracting over the next decade. Now, more than almost any time I can recall, the world is a very dangerous place in many dimensions. Submitting a proposal for a task order under an 8(a) Government Wide Acquisition Contract does not result in automatic recertification of the offeror’s small business size status. 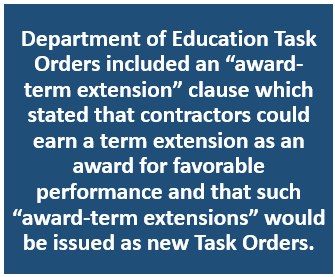 In a recent decision, the SBA Office of Hearings and Appeals held that unless the Contracting Officer expressly requires recertification, an offeror’s size for an 8(a) set-aside task order is governed by that offeror’s size status for the underlying GWAC. SBA OHA’s decision in Size Appeal of Reliasource, SBA No. SIZ-5536 (2014) involved a Homeland Security RFQ for IT support services. The RFQ stated that DHS intended to award the contract as a task order under the 8(a) STARS II GWAC. The RFQ was set aside for 8(a) participants under NAICS code 541513. After evaluating quotations, the Contracting Officer announced that KNEWEBS, Inc., d/b/a Consulting Services Inc. was the apparent awardee. An unsuccessful offeror, Reliasource, filed a SBA size protest. Just six weeks into fiscal 2012 and federal contractors are looking back at a topsy-turvy fiscal 2011 that was dominated by turbulent congressional battles over continuing resolutions and the debt-ceiling debate. With fewer dollars available for contracts and new purchasing and task order competition rules going into effect, no wonder the word “uncertainty” popped up often in a canvass of federal contracting executives. However, most executives said they were pleased with their results in fiscal 2011. “It was not a terrible year, but there was definitely some budget pressure and some competitive pressure,” Wilson said. Art Richer, president of immixGroup, compared fiscal 2011 to 2009 when the federal budget also became law late in the year, which changed a lot of the dynamics of buying technologies. Agencies were “kind of forced to make decisions here towards the end of the year and certainly in their capital expenditures and how they were going to buy,” he said. This past fiscal year was quite different, he added. “We saw a little bit of a soft patch here from December through August,” Richer said. But as agencies put some of their plans into effect in July, August and September, sales started to pick up, he said. The biggest problem for contractors was “the uncertainty of what’s going on and not having a clear line of sight into how the budget issues get resolved,” said Kevin Parker, president and CEO of Deltek Inc., a provider of enterprise software and information solutions to government. “We know of some customers that had very successful years,” Parker said. “And if they’re in the right agency with the right contract vehicle, they feel pretty good about their prospects for the future. On other occasions, people have lost contracts or contracts have been delayed and they’re feeling a great deal of pressure,” he added. Parker said people are looking for business development opportunities and are focused on understanding what opportunities there are and how to compete for them effectively. “That is almost a universal theme that we’ve seen,” he said, citing intelligence, cybersecurity, and training and development of resources, as the top three areas of interest. Despite the contentious issues and uncertainly, even small businesses experienced growth in fiscal 2011. “We’ll do shy of $70 million in [government] revenue this year. We started from a base of $20 million two years ago so we’ve grown pretty substantially,” said Joe Moye, president of Capgemini Government Services, a relative newcomer to the federal market. Nevertheless, he called fiscal 2011 a difficult year. “It was difficult in the sense that we’re not achieving the growth we had hoped, but we’ve still grown 25 percent,” he said. Because Capgemini Government Services is part of a much larger company, it does not operate with Small Business Administration small-company advantages. Therefore, company has had to work twice as hard to be successful in winning federal contracts and getting on the GSA Schedule during the past few years, Moye said. The congressional battles over the continuing resolutions has had more of a negative effect on the company’s bottom line than the budget constraints did because “when you’re in growth mode versus sustain mode, [as we were] we didn’t have all the contracts that were just going to continue to feed us. So it hurt our growth a little bit,” Moye explained. URS Corp.’s federal services business also continued to grow in 2011, especially in the first half of the year, said company President Randall Wotring. Overall, he said, URS had a good year despite the budget uncertainties and delays caused by continuing resolutions and the debt-ceiling debate. “That’s not new news. I believe that all the federal service providers are claiming the same thing,” Wotring said. “But from our standpoint, frankly, our pipeline of opportunities that we’re able to address has increased nicely so we’re happy about that,” he said. Britt acknowledged that the health care and emergency response sectors haven’t felt the negative effects of the budget uncertainties as other sectors have. “We’re a smaller firm so I don’t think we felt the impact and I don’t think the industry overall has felt the impact of the budget [issues],” he said. The small, 13-year-old company has maintained a 50 percent growth rate for the past three years, including fiscal 2011, Britt said. About 70 percent of Apprio’s government business comes from the Health and Human Services Department with the remainder from the Veterans Affairs and Defense departments, and FEMA. Apprio’s emergency response sector also did well in fiscal 2011, he added, mainly as a result of the summer tornados in Joplin, Mo., Hurricane Irene and Tropical Storm Lee, and the rare earthquake in central Virginia. However, no one doubts there will be new storms – natural and manmade – in this fiscal year too. About the Author: David Hubler is senior editor of Washington Technology. Published DEc. 2, 2011 at http://washingtontechnology.com/articles/2011/11/14/strategy-fiscal-2011-retrospective.aspx?s=wtdaily_061211. Under a proposed new rule, small companies are expected to get more business through multiple-award contractors because that’s where the money has increasingly been going since the mid-1990s. Regulators have revised the Federal Acquisition Regulation (FAR) to match the fluctuation toward task-order contracts, such as governmentwide acquisition contracts, blanket purchase agreements and agencywide contracts. The Office of Federal Procurement Policy has pushed those types of vehicles to streamline purchasing and get lower prices. Officials released an interim rule Nov. 2 about the FAR revisions. The rule took effect the same day. The changes make clear that contracting officers can set aside orders for small businesses both on blanket purchase agreements under the General Services Administration’s Multiple Award Schedules and on multiple-award contracts. The revisions add a new section in the FAR. It authorizes agencies to set aside one or more contracts for small business on a multiple-award contract, including any of the socioeconomic programs, such as the service-disabled, veteran-owned small business program. Officials are hopeful for what the changes will bring to small businesses. at the Defense Department, GSA, and NASA expect agencies to take advantage of the set-aside revisions. They want agencies to identify possible multiple-award contracts through which they could set- aside orders for small businesses. They also want agencies to set aside more orders when using GSA’s Schedules, according to the notice. The changes are based on law and an advisory group. Congress included language in the Small Business Jobs Act, which became law in 2010, addressing set-asides among task and delivery orders. Also in 2010, an interagency panel, which was created by President Barack Obama to study small-business contracting, found the issue needed some attention since multiple-award contracts have become so popular. “There has been no attempt to create a comprehensive policy for orders placed under either general task-and-delivery-order contracts or Schedule contracts that rationalizes and appropriately balances the need for efficiency with the need to maximize opportunities for small businesses,” the Task Force on Small Business Contracting wrote in its report. 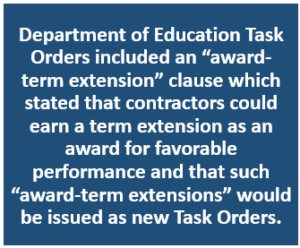 The Small Business Administration is considering changes to its rules that would allow an agency spending its money through a task or delivery order to chalk up the awards to its own subcontracting plans, according to a Oct. 5 Federal Register notice. Agencies could start to get credit toward their annual small-business subcontracting goals for their orders placed against multiple-agency contracts, a perk for agencies as procurement policy officials push strategic sourcing. Each agency has to set its own annual goal to make sure that various types of small businesses have an opportunity to participate in its contracts. Currently though, when purchases come through an inter-agency contract, the agency that holds the contract gets the credit. That applies to the General Services Administration Schedules contracts too. For example, consider an agency that places an order against a governmentwide acquisition contract. Say a large company gets the award and subcontracts some of the work to a small business subcontractor. The agency that hosts the GWAC gets the credit for hiring a small business, not the agency placing the order. Prime contracts work differently. If an agency awards an order placed on a GWAC directly to a small business, the purchasing agency gets the points. Agency officials have told SBA they would like to get the small-business subcontracting credit when they’re spending the money. SBA is also considering giving discretion to the contracting officer from the agency that’s placing the order to establish the subcontracting goals related to the individual orders. Officials also want real-time insight into subcontracting on interagency contracts. Contractor may have to report their subcontracts with small businesses to the host agency’s contracting officer for each order. Currently, contractors are reporting to the agency twice a year at the most. “Reporting on an order-by-order basis will allow the funding agency to receive credit towards its small-business subcontracting goals,” SBA writes in its proposal. SBA is taking input on the proposal through Dec. 5. In light of SBA’s changes, Dan Gordon, administrator of the Office of Federal Procurement Policy, has pushed agencies to think beyond their own purchasing and, instead, buy with the government in mind. Strategic sourcing gives the government leverage over the contractor in setting prices. 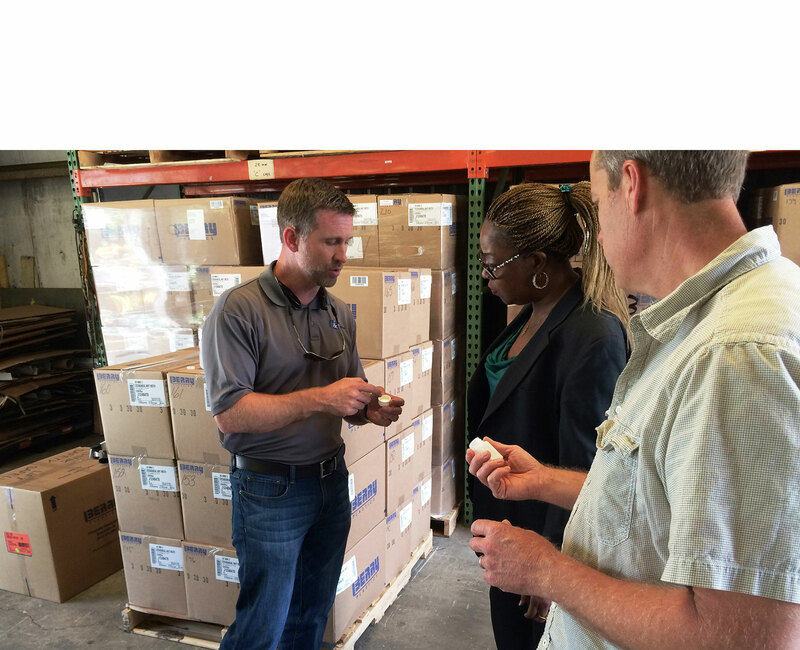 A greater quantity of potential orders encourages contractors to lower prices. Office of Management and Budget officials believe agencies want to use more interagency contracts in order to squeeze the most out of their funds and lessen their employees’ workload. “Particularly in this tight budgetary environment, agencies have told us they are eager for tools that can help them stretch a dollar further and do more with less,” an OMB spokeswoman said Oct. 5. SBA’s proposed change may make subcontracting goals slightly easier to meet, especially if agencies are turning more toward the interagency contracts, said Ken Dodds, senior attorney at SBA. He said agencies would find it more difficult to meet subcontracting goals if they didn’t credit. About the Author: Matthew Weigelt is a senior writer covering acquisition and procurement for Washington Technology. This article appeared Oct. 12, 2011 at http://washingtontechnology.com/articles/2011/10/12/sba-subcontracting-credit-multiple-agency-contracts.aspx?s=wtdaily_141011. Paul Bell, president of Dell Inc.’s Global Public and Large Enterprise sector, makes no bones that Dell is taking the mergers and acquisitions route. He said Dell is still in the early stages of its M&A activity even though the giant hardware and services company has acquired nine companies in just 18 months. Dell’s marketing strategy is to serve its federal clients with the unified face of one company, Bell said. “That won’t change even if we add 25 more companies, which is likely in the coming years,” he said but declined to go into specifics about future M&A targets. DRC’s capture strategy always includes IDIQ contracts. “If you’re not playing on certain IDIQ contracts, you’re really left out in the cold,” Strasser said. Strasser said DRC has been successful because it concentrates on its five core market segments: homeland security, health, cybersecurity, intelligence and Defense Department strategic programs, and financial and regulatory agencies. Its IDIQ wins include the Internal Revenue Service’s Total Information Processing Support Services contract, General Services Administration’s Alliant contract, the Army’s Program Management Support Services and Homeland Security Department’s Enterprise Acquisition Gateway for Leading Edge Solutions (EAGLE) contracts. Strasser said DRC identifies new targets at twice-yearly strategic planning sessions during which the company determines the government’s needs and its funding levels. Company executives also attend independent analysis sessions and participate in a number of industry associations. “We have people in key positions to not only be aware of changes in the industry, the legislation and how the money is being budgeted but also to sort of influence those [groups],” Strasser said. DRC’s fastest-growing market is health care, an area in which the company had virtually no business just five years ago. Strategic investment discussions, off-site company assessments and peer reviews that began about five years ago led to action plans for DRC to target federal health care contracts. “Today in the federal group that I manage, we’re going to do over $30 million this year in health-related services and solutions,” Strasser said. As an example, he cited the $19 million Tricare Evaluation, Analysis, Management and Support, a Military Health System Category 2 acquisition contract that DRC won last year thanks to its management consulting expertise. DRC is helping the Walter Reed Army Medical Center manage its Base Realignment and Closure movement. Although DRC does not have a chief medical officer, its staffing does include clinicians and doctors. Hoover said that after he joined the company in 2006, ASC instituted an infrastructure investment plan to strengthen its five key market targets: command, control, communications, computers, intelligence, surveillance and reconnaissance; acquisition and logistics; readiness; homeland security; and national intelligence. “We also expanded our recruiting function significantly as well because we knew that was going to be important, too,” Hoover said. “I would say that probably our back office, which really is the infrastructure side of the business, was probably about 60 or 70 people. And we’ve probably increased that by about 50 percent or so,” he said. Another goal was to strengthen ASC’s capture management program and establish a project management office to oversee the company’s IDIQ contracts and meet the needed quick turnaround on task orders. “Although the bulk of the investment was probably back in the 2006-2007 time frame, we continue to invest in our infrastructure to make sure that we can be as responsive as we can possibly be on these opportunities,” Hoover said. In addition, ASC is aggressively expanding its pipeline of individuals “so that we have a living and breathing database of candidates for a variety of opportunities in the focused business opportunity areas that we’re interested in pursuing,” he said. ASC uses that database to strengthen its proposals whether it is pursuing an IDIQ or a large single-award prime contract. To keep the database current and growing, executives attend job fairs and conduct informational seminars. “We have that database of [potential contract and current] employees that we can very quickly pull together because, on the IDIQ side, you have a very rapid turnaround of proposals, and we can then provide the résumés to go after those faster-turnaround opportunities,” Hoover said. “We’re constantly looking for individuals with the requisite experience, the requisite customer focus, the requisite capabilities,” he said, adding that this is particularly true when going after an IDIQ or task order from the intelligence community in which background checks and security clearances are critical. “The name of the game has changed with the government predominantly using some of the larger vehicles,” said Shiv Krishnan, chairman and CEO of Indus Corp., who recently hired Terry Fitzpatrick as vice president to oversee business development and growth. Indus emerged from the small-business program about 10 years ago and positioned itself to go after large contracts, including governmentwide acquisition contracts, known as GWACs, he said. “If you do not bid on these GWACs, then you’re shut out of opportunities coming through those [awards] and those [represent] billions of dollars of opportunities for the next seven or 10 years,” Krishnan said. Indus set up the infrastructure to compete for GWACs by meeting government requirements, such as having an earned value management system, a government-approved purchasing system, Capability Maturity Model Integration certification, and positive past-performance evaluations. “You need to be positioned; you need to be close to the customer,” he said. That’s what Fitzpatrick’s business development team does two to three years in advance, Krishnan added. Indus was successful in 2009 when it bid for a spot on the 10-year, $50 billion Alliant contract. “That was a feather in our cap and the beginning of our [capture] strategy,” Krishnan said. For several years Indus tracked the planned EAGLE II, Network Centric Solutions II and National Institutes of Health’s 10-year, $20 billion Chief Information Officer — Solutions and Partners 3 awards. When they finally were announced in 2010, the company was ready to bid on all three, Krishnan said. The company also is adding health IT capabilities. GWACs and agency-specific enterprisewide acquisition contracts have been popular, he said, because the government does the upfront work of selecting qualified contractors, and the competition to perform the task orders is limited only to those companies. However, Kevin Plexico, vice president of research and analysis services at Deltek Input., a market research and intelligence firm, cautions against relying too heavily on GWACs, including Alliant and NASA’s Solutions for Enterprise-Wide Procurement. That trend is expected to continue, effectively reducing the number of prime contract opportunities, Plexico said. For example, he said, about half of DHS’ IT services go through the EAGLE contract. “If you don’t have a position on EAGLE, you can effectively think about your opportunity inside DHS as being limited to the other 50 percent that’s outside the EAGLE contract,” Plexico said. In addition, the growth of task orders has greatly reduced the time frame in which to pursue them compared to the traditional 30-, 60- or 90-day response time for traditional requests for proposals. Plexico said a Deltek Input study of about 11,000 task orders from 18 contract vehicles found that more than half of them required contractors to respond in less than two weeks.